Everybody likes a treat once in a while. Even dietitians. Even health-conscious eaters. Even vegans. Even everybody. So I’m grateful whenever I find treats for the alternate diet crowd that are super delicious. 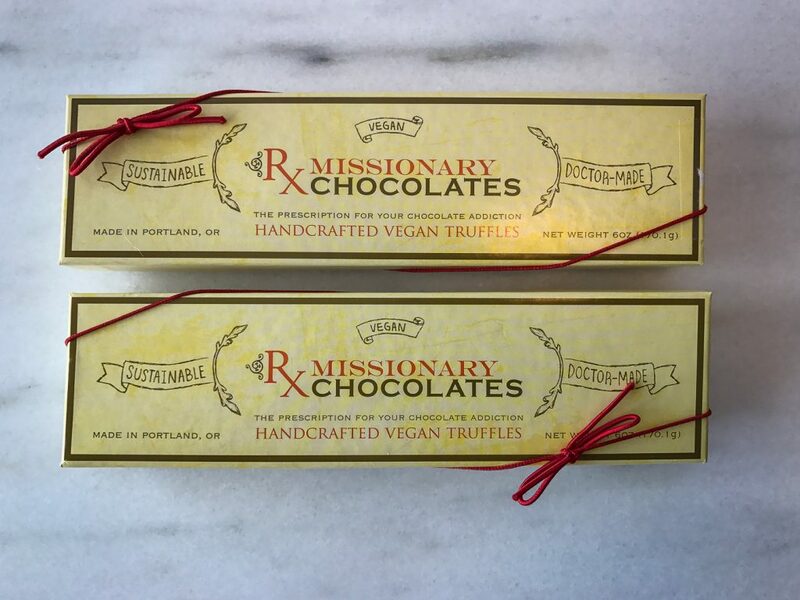 Today I’m highlighting Missionary Chocolates from Portland, Oregon. They’re vegan (which works great for the dairy-free crowd) and gluten-free. And chocolate! My marvelous sister-in-law first introduced me to this wonder of vegan wonders. We were eating vegan pizza at Dove Vivi Pizza last fall, and she suggested we might like their vegan dark chocolate truffles for a little after dinner bite. She was right of course, and we were delighted to find out the truffles were made by Missionary Chocolates, which was right across the street. We made a plan to return in the morning on our way out of town. When we arrived, there was a crowd waiting outside to be let in. Guess we aren’t the only superfans. Since last fall, I’ve ordered Missionary truffles several times for myself and as gifts for friends and family. Even my non-vegetarian 17 year old niece is a Missionary enthusiast, favoring the Earl Grey over all others. I realized last month that I’d never blogged about this tasty discovery so used it as an excuse to place yet another order. You know, for professional purposes. 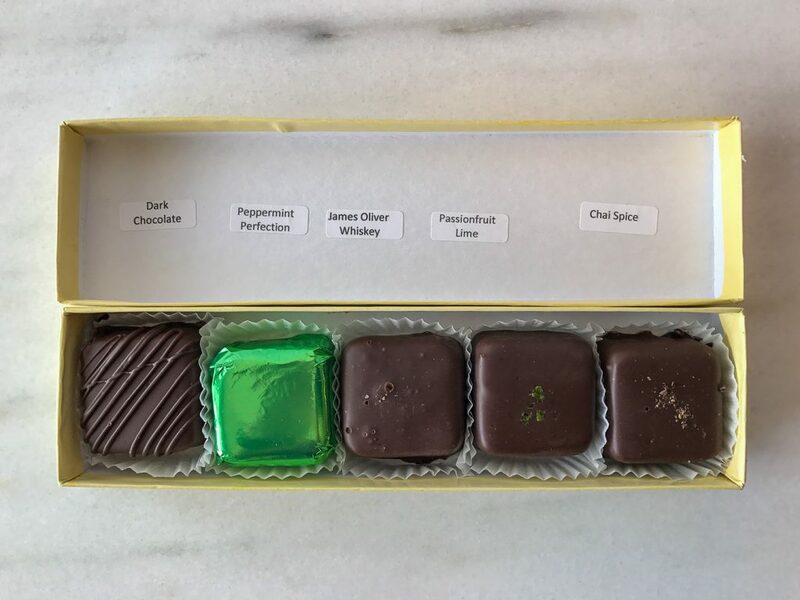 I ordered two custom 5-piece boxes with some of my favorite flavors and a few new ones. 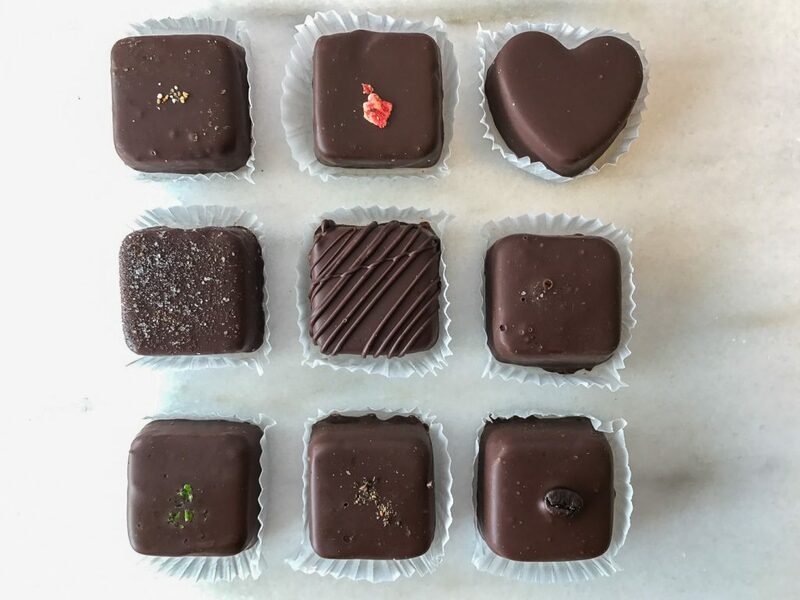 Here is my best attempt at describing yummy chocolate 10 different ways. Meyer Lemon Explosion: This was the first one I sampled as soon as my very important package arrived. It was surprisingly tart, and pleasantly acidic; this was not a subtle lemon flavor in a mostly chocolate package. The citrusy tang was up front, in your face. It makes me wonder how they get such a bold, authentic flavor; maybe by using both lemon juice and zest? In any case, it was wonderful as the tartness was tamed by the creamy smoothness of cocoa butter and coconut milk. Scrumptious. Simply Espresso: I expected this square of chocolate goodness to be just as prominent with its espresso notes, but I’d have to say it was barely there. It just hinted at coffee undertones, but is was still awfully good. You know how chocolate recipes sometimes call for a few ounces of brewed coffee or a few teaspoons of instant espresso powder? The experts tell you this little addition boosts the chocolate profile of the brownie, cake, etc. I feel it’s the same effect here. My take was that it just sort of just enhanced the rich chocolate flavor. 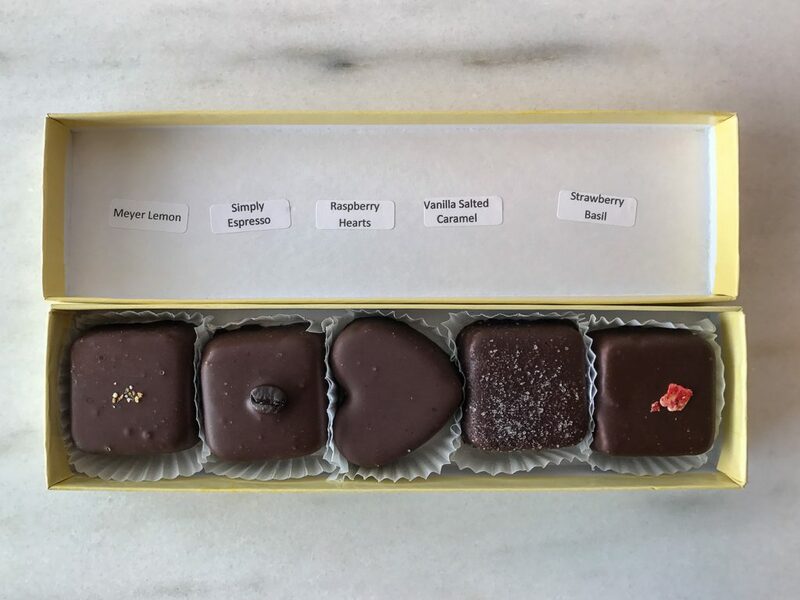 Raspberry Heart: Chocolate and raspberry is one of my favorite fruit/chocolate pairings, and after the amazing burst of fresh lemon flavor in the first truffle, my expectations were understandably high. This truffle was delicious, but I found myself wanting more raspberry oomph. What’s cool is that you know she uses real fruit and not flavorings or extracts because this truffle was holding onto fresh berry evidence: the seeds. Vanilla Salted Caramel: OK. Hold the phone. Does anyone still say that? OK, how about hold everything? Shut the front door? Am I getting close? This was the very most best truffle of all. Next time I might just order myself a box of exclusively Vanilla Salted Caramels. The sweetness and saltiness and chocolateness are perfectly balanced all together in one place. And in case you might be confused when you order your box of all Vanilla Salted Caramels, it’s a caramel truffle. It doesn’t have a runny or chewy caramel filling. That’s kind of one of the things that’s amazing about it. 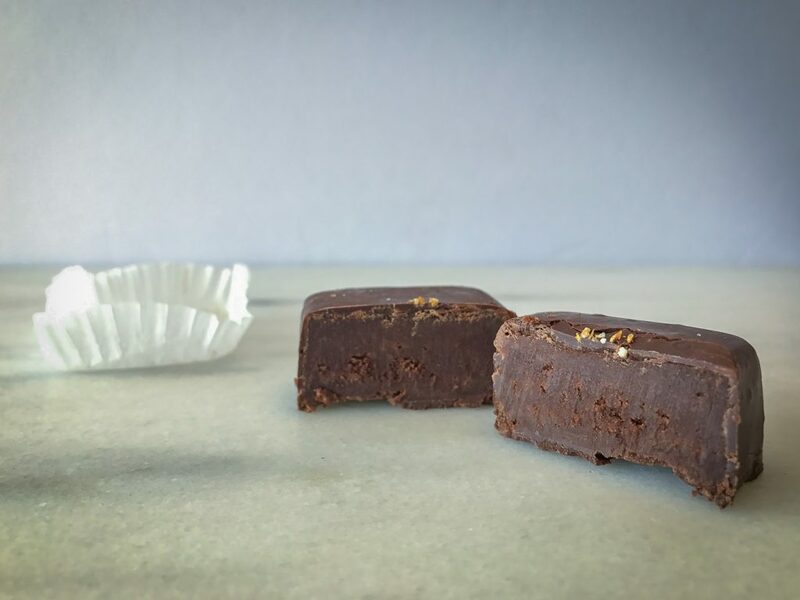 The fudgy truffle filling tastes almost exactly like caramel. Its rich, roasty flavor is confectionary perfection. Strawberry Basil: Another berry and chocolate combo I was pumped for. So I was unprepared for the basil to predominate, with its grassy, greens-like essence. The strawberry flavor here was far overshadowed by the basil. Despite the fact that this was not my favorite flavor, I loved that my teeth hit upon bits of strawberry and strawberry seed because the other truffles are typically perfectly smooth inside. Also, in keeping with the theme so far the flavors tasted authentic instead of artificial, like real fresh-picked juicy berries and soft tender green basil leaves. One strange side effect of this particular truffle: I was burping basil leaf aftertaste for an hour. Dark Chocolate Delight: I would say this is their basic truffle. Their signature truffle. It’s the one that introduced us so successfully to Missionary in the first place. Its dark creamy taste is simple but remarkable. Peppermint Perfection: Do you know Frango mints? From Frederick and Nelson department stores? This tasted just like that, so it was a little trip down memory lane for my tongue. The peppermint isn’t as prominent as say a York Peppermint Pattie. It’s more subtle, and paired with the silky smooth texture of truffle filling it was quite enjoyable. James Oliver Whiskey: This had a mild but satisfying whiskey flavor. It was sort of like the espresso where it served mostly to elevate the dark chocolate flavor. In this case it almost just gave the dark chocolate a more profound bitterness. The bittersweetness is one of the reasons I prefer dark chocolate to milk chocolate in the first place, so it’s a successful combination. Passionfruit Lime: A favorite this was. And very similar to the Meyer Lemon truffle. The tart lime flavor was simply awesome. My palate couldn’t really pull out the passionfruit flavors, but it felt like this tropical addition just made the overall lime experience more intense and extra fruity. Chai Spice: Despite my love of a good steaming cup of chai tea, this was good but not fantastic. It evoked pumpkin pie for me more than traditional chai spices, so it tasted like fall. This was the second truffle that stuck with me for a while. It left an aftertaste of allspice or cloves for several minutes after finishing. Clearly I had favorites and non-favorites, but let’s be real here. They’re all chocolate, they’re all sweet, and they’re all tasty. One tip from a person who is apparently slow to eat chocolates, eat them while they’re fresh. Mine came in the mail so they were a few days old to begin with. Then it took me a week and a half to gnaw my way through both boxes and by then they were starting to dry out a bit and lose some of their flavorful punch. Let’s get down to brass tacks. Does anyone still say that? OK, how about down to the nitty gritty? This is a nutrition blog, so let’s do the numbers. 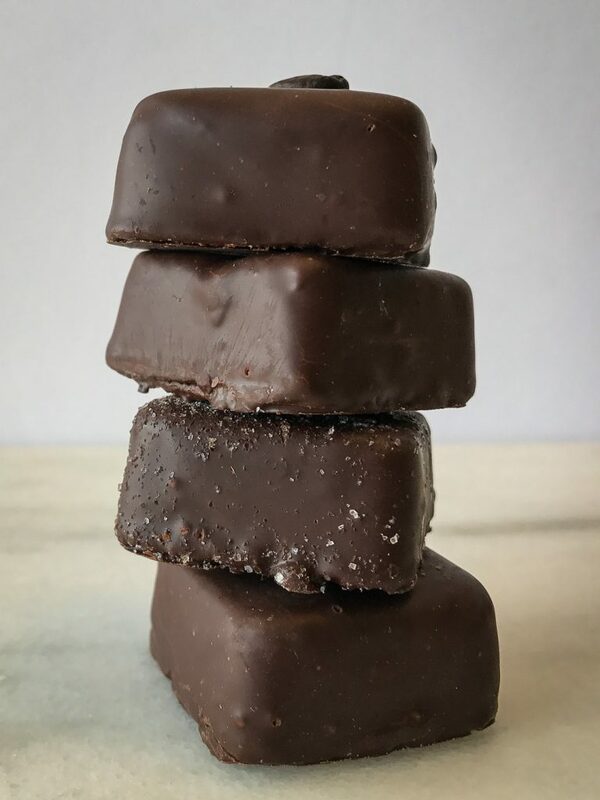 The Nutrition Facts on the website for the Dark Chocolate Delight show 160 calories, 12 g fat (7 g saturated fat), 15 g carbohydrate (2 g fiber, 12 g sugar), and 2 g protein. Remember, these are substantial, multi-bite truffles, not pop-em-in-your-mouth nibbles. The serving size is listed as 40 g, and after doing some quick calculations, I’m assuming this is for one truffle. I could confirm that, of course, had I not already consumed the evidence. I’ve got an email in to the company to double check. Most traditional truffles are made with cream and butter, so what makes Missionary unique is its use of coconut milk instead. You might notice that the saturated fat content is pretty high. (A ballpark recommendation is to stay under about 22 g a day.) This is primarily because coconut milk is high in saturated fat. It’s still a plant food, and it’s cholesterol free, but that doesn’t mean it’s low calorie or low fat. I mean we want truffles to melt in our mouths, right? And that only happens when you use a lot of fat. There was a generalized ingredient list on the box that encompasses their spread of flavors: chocolate (cacao beans, sugar, cocoa butter, soy lecithin, sunflower lecithin, vanilla), coconut milk. May contain: brown sugar, espresso, lemon, lavender, peppermint oil, blood orange, raspberry, pineapple, coconut, rum, strawberries, basil, passion fruit, lime, whiskey, peach, habanero, sea salt, spices. Nothing about this brown rectangle hints at the shocking lemon flavor contained within. This list gives you a hint at some of the other flavors Missionary has dreamed up: blood orange cardamom, peach habanero, spicy cinnamon chipotle, and local lavender. And they change up with the seasons, so you mind find something even more wonderful on their website or in the store than what I’ve reviewed here. The cost for the 5-piece custom box is $15 plus somewhere around $4 shipping. Better yet, if you’re ever in Portland, go by the store on NE Glisan Street. During our Sunday afternoon visit they were astonishingly generous with samples. We probably each had 6 or 7 “bites” to help us decide which flavors to take home. 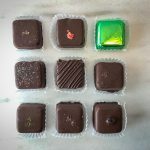 Whether they could tell I was a dietitian or a health-conscious eater with vegan tendencies, these purveyors of chocolate treats didn’t let on. What do you reach for when a your mind is in treat mode? Have you found a reasonably reasonable sinful sweet? Disclaimer: This is not a sponsored post. I purchased these Missionary products myself and chose to do a review because I liked them and wanted you to know about them.